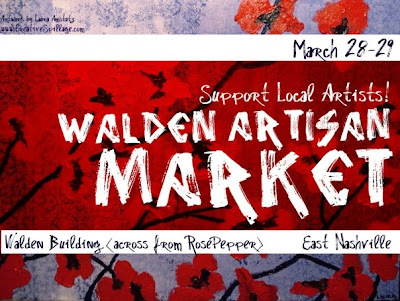 The Walden Market is happening again this weekend over here in East Nashville. 9am to 4 pm this Saturday and 10am-3pm on Sunday. I'll have a booth along with other awesome handmade and vintage vendors, so come on down! It's a good time to be shopping for Mother's and Father's and Easter gifts! Hi there! I am also participating in the Artisan Market this weekend and wanted to pass on to you that I was told different hours by Alison. Sat. 9-4 and Sun 10- 3. Also, I've made a flier on my blog if you want to distribute, feel free to use the image!